a little bit of history in tax studies | What's that you said? Man, those republicans REALLY don’t like anything that disagrees with them, do they? If you are a Republican member of the United States Senate, you do everything in your power to suppress that report—particularly when it comes less than two months before a national election where your candidate is selling this very economic theory as the basis for his candidacy. Initially released on September 14, 2012, the study—authored by Thomas Hungerford who is a specialist in public finance at the C.R.S.—correlated the historical fluctuations of the highest income tax rates and tax rates on capital gains dating back to World War II with the economic growth (or lack of the same) that followed. Lowering the tax rates on the wealthy and top earners in America do not appear to have any impact on the nation’s economic growth. So, natch, THIS COULD NOT BE ALLOWED TO STAND! Not surprisingly, the results of the study caught the attention of a great many conservatives—so much so that, according to a New York Times piece, Republican’s in the United States Senate successfully pressured the Congressional Research Service to withdraw the report shortly after it was released. The withdrawal came over the objection of the CRS economic team and the author of the study. 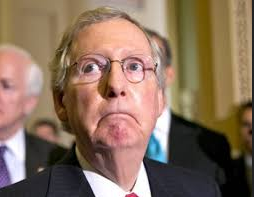 The Times further reports that, according to Senate Minority Leader Mitch McConnell’s spokesperson, Senator McConnell—along with additional GOP senators— “raised concerns about the methodology and other flaws,” adding that additional people outside of Congress were also criticizing the study. The nature of these alleged flaws? Democrats are pulling it back into the public arena. For almost 100 years, the Congressional Research Service has worked to assist Congress by providing well-researched and accurate data to be utilized in the creation of important public policy. It has done so when Congress was controlled by Democrats and when Congress has been under the control of Republicans. No matter what party was in charge, the C.R.S. has always endeavored to keep politics out of their work in the effort to provide data that would inform and advance our public policy. This entry was posted in U.S. Politics and tagged economy, politics, taxes, usa. Bookmark the permalink.